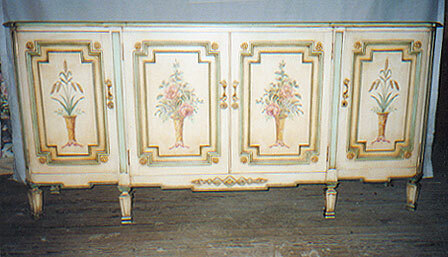 Late 19th Century - The panels were painted in a motif that compliments the vertical panels. Wicker baskets filled with formal flower arrangements or shafts of wheat decorate the doors. Detailed and decorative, they recall Pompeian fresco motifs viewed through framed panels. The marble top was toned with glazes to soften the effect.